The mechanisms that underlie early embryonic development in humans and cattle are very similar. Therefore, Eckhard Wolf and coworkers argue that bovine embryos might well be a better model for early human development than the mouse system. Many fundamental aspects of the early stages of embryonic development in humans are found to be conserved in other mammals. This is why studies carried out on animal models can help us to understand the development of the human embryo. Most of these studies have been done on mouse embryos. 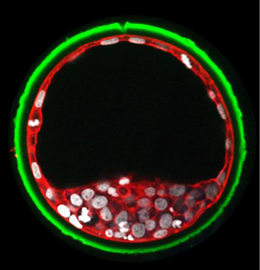 Researchers led by Professor Eckhard Wolf, Chair of Molecular Animal Breeding and Biotechnology at the Gene Center and the Department of Veterinary Sciences at LMU, now report in the journal PNAS, that early phases of the development of bovine embryos, might offer a better system for the understanding of the earliest differentiation steps.